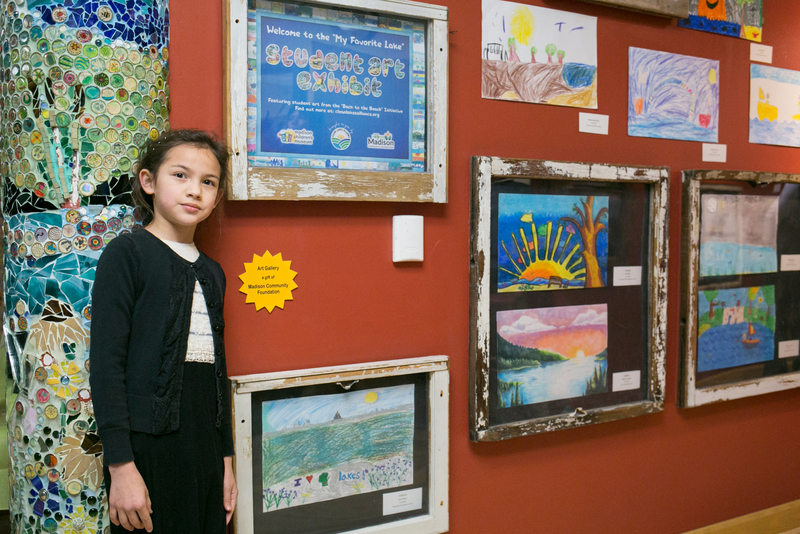 Pictured above: The winners of the "My Favorite Lakes" poster contest, sponsored by Clean Lakes Alliance and supported by Madison Community Foundation, were displayed at the Madison Children's Museum's gallery. What makes Madison special for you? Lakes? Education? Libraries? Arts? Festivals? Chances are, there’s a nonprofit (or two, or five) working hard to save those lakes, make that education accessible, build that new library, put on a show, or gather the community for a free event. Every day in Dane County, staff at 2,900 501(c)(3) nonprofits go to work to make this a better world for all. They strive for excellence, for equity, for an equal playing field. They feed the hungry and the curious. They provide affordable shelter and accessible parks. They nurture families and neighborhoods. They mentor, they tutor, they teach. They restore, they protect, they sustain. You, as a resident of Dane County, have tens of thousands of nonprofit employees constantly looking for new ways to make this an extraordinary community. And I, as the coordinator of Madison Community Foundation’s Community Impact grantmaking program, get to spend every day working with these nonprofits, providing funding and counsel to help put wind in their sails. MCF is winding up our 75th anniversary celebration. When we began the planning several years ago, we talked to other community foundations about their anniversaries. One city provided free access to major venues each month—a free day at the zoo, or a free day at the museum. Of course, this wouldn’t work here because Madison is blessed with an amazing zoo and several museums—all of which are already free to the public! I was at the Madison Children’s Museum on one of their free nights recently and the place was hopping. Kids and their families were interacting, moving and making, building a paper and cardboard replica of the Capitol, exhibiting artwork inspired by the lakes, combining wonder and joy and learning. I stopped to admire all of this energy and creativity swirling around me. Madison Museum of Contemporary Art displayed Do Ho Suh’s hand-sewn, translucent cloth installation of a full apartment that visitors could walk through. Every detail lovingly crafted, down to wonderful steam radiators and door hinges. Henry Vilas Zoo created a new badger (the animal) exhibit that featured a large sculpture of Bucky Badger (the mascot) and designed carpeting for the new badgers (Kaminsky and Dekker) that pays homage to Camp Randall Stadium. Theatre Lila created a magical new play, “The Bed,” using music and movement that had the entire cast interacting around a set comprised of one large, ethereal bed. Dane Arts Mural Arts has created over fifteen new murals in the past few years, but my favorite so far is the mural at the Literacy Network. Artists and students created a colorful, pastoral Wisconsin landscape using painted pieces of paper taken from literacy tests and exam booklets. A brilliant combination of mission-driven literacy and community artmaking. The Madison Design Professionals Workgroup propelled the John Nolen shorefront redesign forward, providing a transformative vision of what may become one of Madison’s most important civic achievements—a nine-acre park and, if the dream is realized, Frank Lloyd Wright’s boathouse designed by the famed architect in 1893. I often tell people that I have the best job in Madison. Why? Because every day I get to work with passionate nonprofit leaders who are committed to helping enrich, evolve, and strengthen the Madison area. These and so many other organizations provide their ideas, energy and enthusiasm—often for free or very little cost—inspiring and tantalizing visitors. I’ve mentioned only a handful of the almost three thousand nonprofits in Dane County doing incredible, meaningful work. To imagine that combined impact is to realize how lucky we all are.